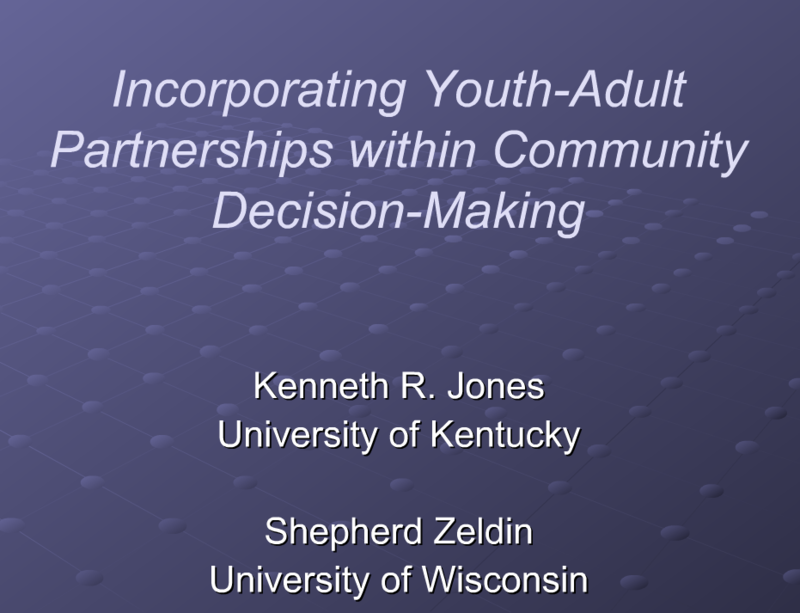 This webinar highlights findings from a national evaluation designed to discover ways states are promoting youth-adult partnerships and other levels of citizenship. The study’s aim was to gain a better understanding of the challenges and successes encountered by 4-H youth development programs when launching statewide initiatives that engage youth and adults as partners. The presenters discuss how they conducted site visits in five states to assess the dynamics of state 4-H youth development offices and to investigate what strategies are being used to promote youth in governance. Learn about barriers that can impede the growth of a partnership as well as gain insight into the practices that build the capacity of youth in governance roles. Jones, K. and Zeldin, S.